There are scams everywhere. Anywhere there’s a chance to make money, there’s an opportunity to do so in a less than honest way. As social networks have grown in popularity, it’s unavoidable that they attract those looking to harness their wealth of information to gain more info on those that populate the site. LinkedIn spammers and scammers are on the rise. Here’s what you should watch out for. We all want to grow our personal networks on LinkedIn. It’s a great way to open new opportunities and build new relationships. But we also have to be careful of who we connect with. Many have gotten in a habit of accepting invites from anyone. While it’s great to grow your network, you also want to be sure you’re not connecting with someone who’s looking to abuse your connection. LinkedIn holds a wealth of information about those we connect with. Not only employment history but also email addresses, phone numbers and more, in addition to allowing free access to message those connections. So how do you spot LinkedIn spammers? Look for profiles that don’t seem quite right. Here’s a profile that recently wanted to connect with me on LinkedIn. Although the work history seems okay and they’re local to where I live, the profile picture didn’t seem quite right. 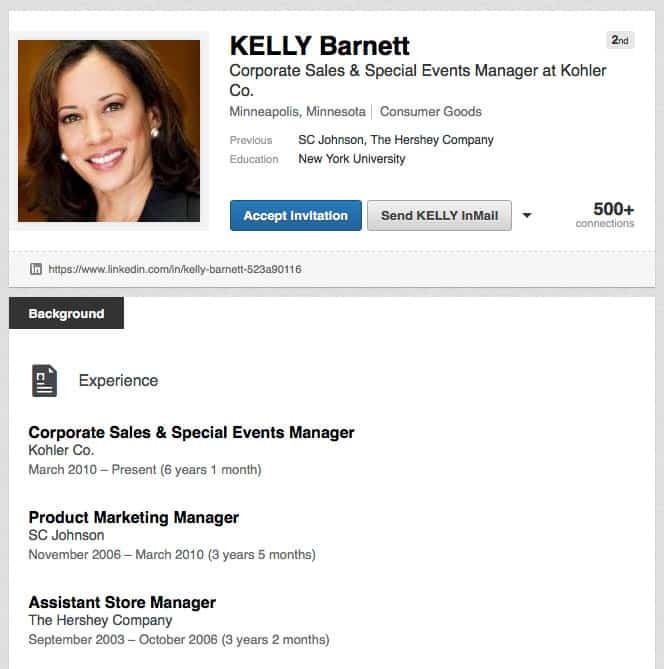 It only took a second to post the profile picture URL into Google and find that the photo actually belongs to Kamala Harris, the Attorney General of California and candidate for US Senate. Here’s another fake profile that recently wanted to connect. Commonly you’ll see spam accounts with all capital letters for their first name. It may be due to the program they use to generate these accounts. While the account stood out as strange right away, it was enough that a former CEO I’d worked with had fallen for it and connected. You can actually see a bit of the watermark in the profile picture and a quick Google image search shows that it’s actually a “business woman” stock photo. While we’re all looking to build a bigger and better network on LinkedIn, it’s best to be sure you either know the person you’re connecting with or make sure they’re really who they claim before connecting. Trusting 2nd connections (as both of the above examples are) won’t protect you, as that requires your connections to be good enough to spot fakes too. Some simple searching should show the fake profiles from the real people. When in doubt, don’t accept. Why Are Spammers & Scammers Growing On LinkedIn? The number of spammers and scammers on LinkedIn has been growing quickly in the past year. As it’s traditionally been a social network targeted less than the others, users haven’t become as alert to the threat as they have on other networks. While many guard those they’re willing to let into their personal lives on Facebook, they’re more open to letting most anyone build their professional network on LinkedIn. Once they’ve connected with you, they now have a direct way to pitch. It no longer costs to send a message to someone you’re connected with, and we often have a more open mind to pitches from connections (even if we don’t really know them) compared to random strangers. As you can see above, many use LinkedIn connections to pitch their products. After connecting, they’re quick to reach out and try to sell. 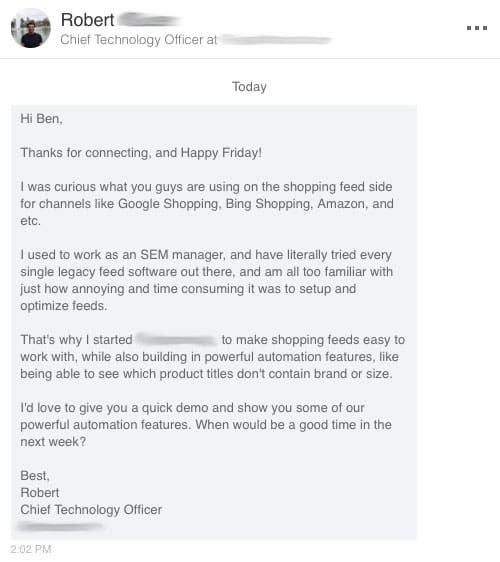 While they could do this using LinkedIn InMail, they’d have to pay to do so, and why bother when most are willing to accept their connection request for free? It only takes a bit of thought to stay safe on LinkedIn. You don’t have to make sure you’ve met every connection that sends you an invite, but you should take the time to make sure they’re real. Take a peek through their profile. Lack of information or activity doesn’t mean they’re not a real person, but does connecting with them really benefit you in that case? 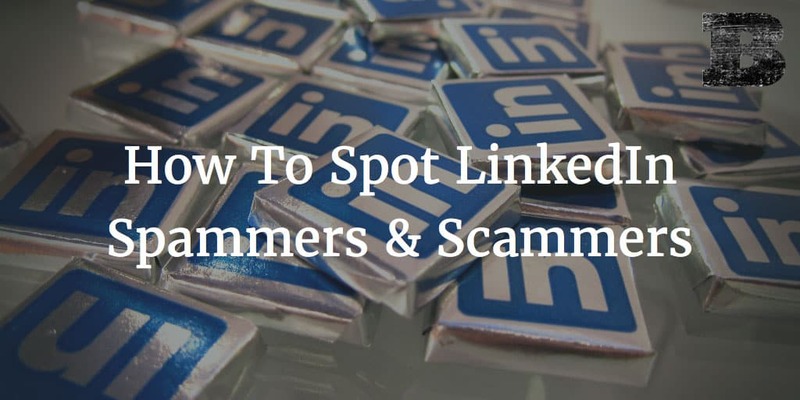 By being aware of the increase in those spamming, scamming, and selling their wares on LinkedIn, we can make smarter choices about who we connect with. Your LinkedIn profile is an important part of your personal brand. Protect it, and you can continue to build a bigger and better name for yourself of LinkedIn.